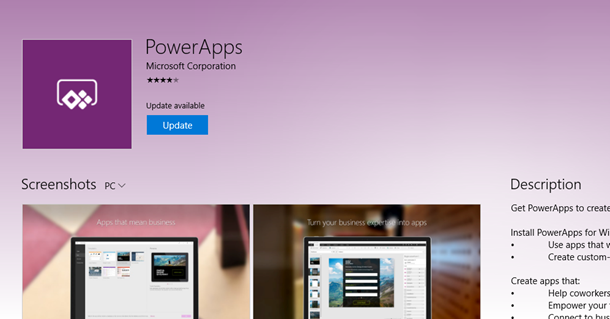 This week we will be updating Microsoft PowerApps with improvements to Studio and Mobile apps. We will cover some of the cool features coming up in this update, with the full list on the What’s new page. All client users who are still using preview builds must upgrade to the latest Windows, iOS and Android bits in the store. This will enable you to take advantage of the latest features in PowerApps. 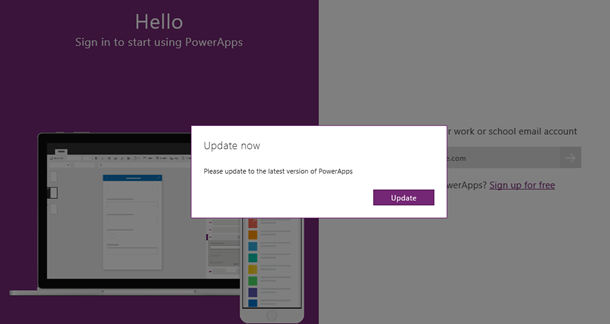 Users running PowerApps versions prior to 2.0.540 on Windows, iOS and Android will be prompted to update PowerApps to the latest version. Clicking on the Update will take the user to the store. Every app is uniquely referred using an app id. To run an app in the browser you would need use a URL with its appid. 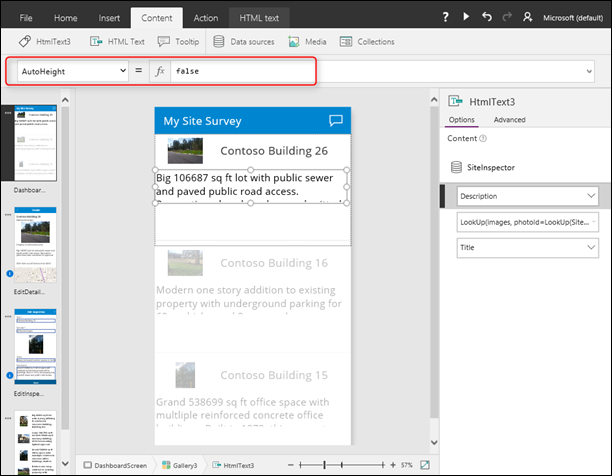 You can get the URL to run the app from the app’s details page listed under the “Web link” section in powerapps.com. Universal links brings these two worlds together. You can use a single HTTPs URL to launch your app either in the mobile app or in the web browser based on your preference. The URL also accept query strings, which you can use to pass parameters to the app. If the user using the link does not have the app installed on mobile, the app runs in the browser automatically. 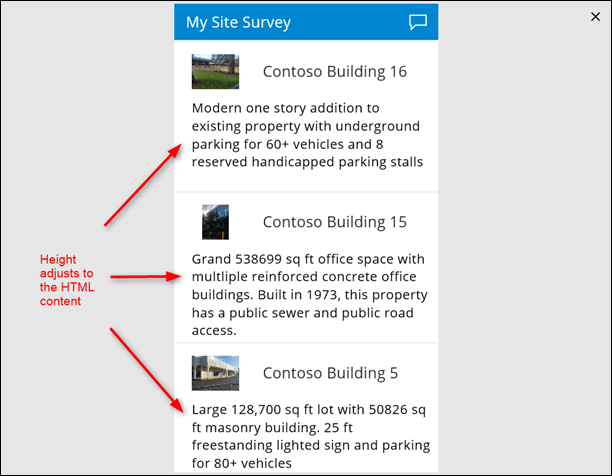 For example, you can link a Site Survey company app to launch another app to collect user feedback. 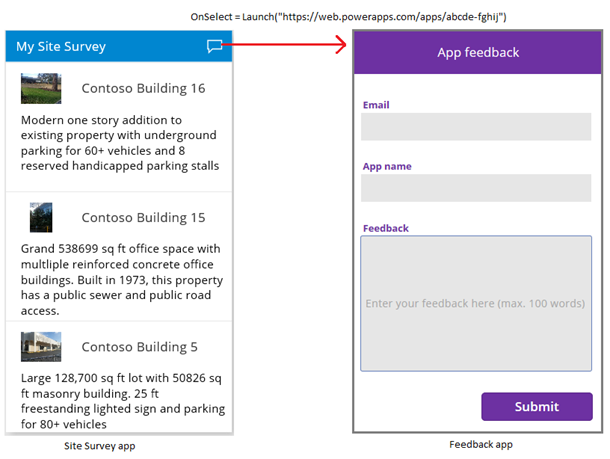 The user feedback app will run on PowerApps mobile if the app is installed. Please note these links launch the mobile apps on iOS and Android. HTML Text control can auto resize the height depending on the length of the text. This is huge improvement over the current control where the control size is fixed and can cause the content to be chopped. To use this feature, simply set AutoHeight to true in the HTML Text control. You can now use context variables as part of delegable expressions. In the examples below, Filter and Lookup delegate the query to the service side even though they contain context variables. 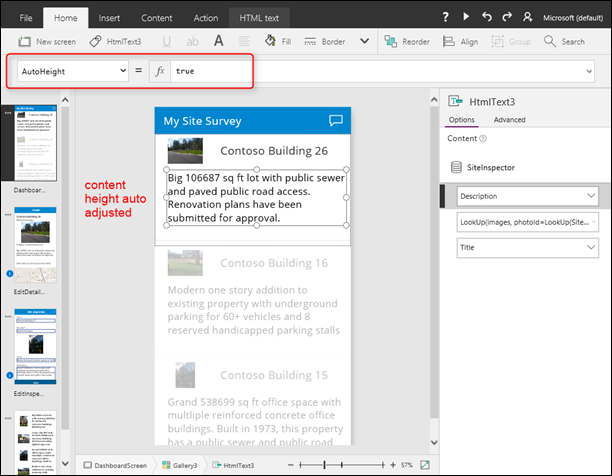 Microsoft PowerApps now supports eight new services this month that you can use in your apps. Azure Resource Manager – Azure Resource Manager exposes the APIs to manage all of your Azure resources. Azure Queues – Azure Queue storage provides cloud messaging between application components. Queue storage also supports managing asynchronous tasks and building process work flows. Chatter – Chatter is an enterprise social network for your company that allows employees to connect and collaborate in real time. Disqus – Disqus is a service for web comments and discussions. Disqus makes commenting easier and more interactive, helping publishers power online discussions. Azure Document DB – Azure DocumentDB is a NoSQL service for highly available, globally distributed app. Sign into your DocumentDB account to create, update, and query documents and more. HipChat – HipChat is group chat, video chat and screen sharing tool for teams of all sizes. Built for business, HipChat is persistent, searchable and loaded with goodies your team will love. WordPress – WordPress is web software you can use to create a beautiful website, blog, or app. PowerApps는 사용자 지정 소프트웨어 개발에 시간과 비용을 들이지 않고도 웹과 모바일을 통해 데이터에 연결하고 작업하는 사용자 지정 비즈니스 앱을 빌드하고 사용하기 위한 서비스입니다. 시작하기 위해 회사 또는 학교 계정을 입력하세요. 등록하면, 서비스 약관에 동의하게 됩니다.